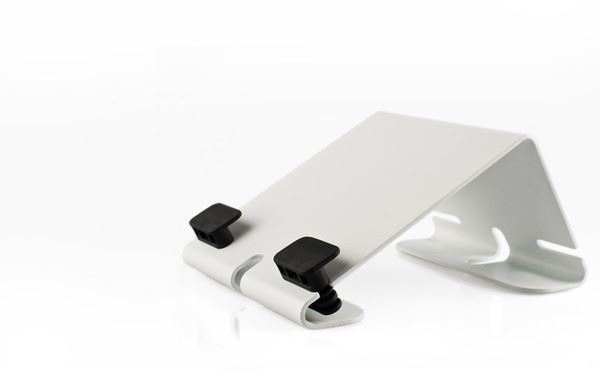 The @Rest iPad Stand has a beautifully simple design. Not only does it complement your iPad, it complements your simple iPad POS app. It's just one steel base with adjustable pads and pegs so you can adjust to your needs. Weighing in at 3 hefty pounds, this tough little stand can bear the weight of countless POS transactions. And if you'd like to secure the @Rest to your counter, you can screw it down through the slots in the steel base. This stand works great with the iDynamo credit card swiper. When you process a credit card sale, simply pick up the iPad and flip to the customer so they can sign with their finger on the screen and enter in a tip (if you've enabled that function). Then you just set it back down and your iPad is at rest! Or, have an employee draw an "x" on the screen and print out the receipt for the customer to sign. Available in 4 solid colors: Bright Red, Sky White, Graphite and Silver. Built in the USA by Heckler Design. iPad not included.